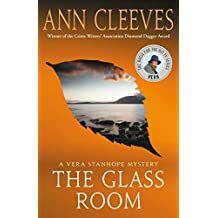 The Glass Room (Ann Cleeves) – Joyce's mystery and fiction book reviews with some non-fiction too! I love Vera too! I have seen the TV show which is available for streaming and have also been working my way through the books. I reviewed The Seagull on this blog and gave it an excellent review. (See Sept. 2017 entry, The Seagull Soars). The Glass Room is an earlier novel, the fifth in the Vera Stanhope series. This one centers on a writers’ retreat, the writer who runs it with her son and those who are there to either learn or teach. Several murders and an attempted murder keep the plot lively. The writers at the retreat are vividly portrayed and each has a backstory (of course!) One of the writers/suspects is Vera’s neighbor which adds additional incentive to Vera to solve the case. It is fun to read a mystery novelist’s take on writers, their preoccupations and their pretensions. The Vera books can be read out of order. Each time, the reader will enjoy spending time with Vera, her colleagues and the mystery itself. Pingback: What an e-book bargain day for mystery lovers! Turow, King, Penny, Winspear, Finch and Cleeves – Joyce's mystery and fiction book reviews with some non-fiction too!